Q. How can I access an article at Hein Online when there is an error? Sometimes linking from the Library@Brunel search results can fail because, for example, the OpenURL link resolver cannot open the document at the correct start page. You might see an error message like this: (see image below). Sorry, the Volume/Page you are attempting to access for the title citation selected does not exist in HeinOnline. 1. 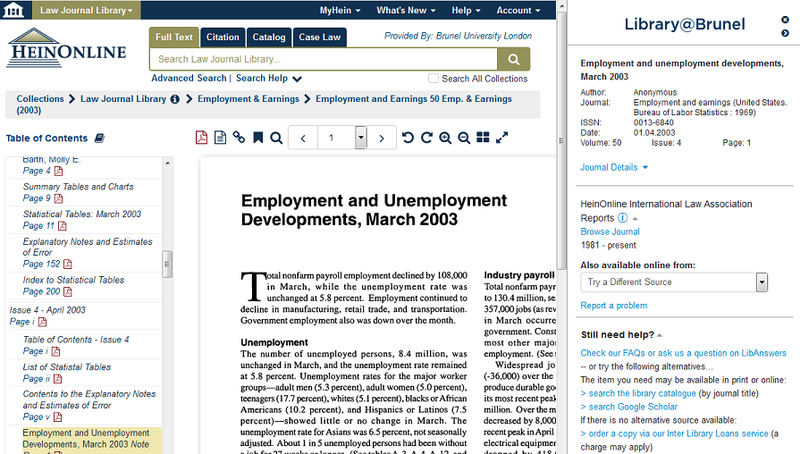 Use the "Browse Journal" link on the right-hand helper frame and browse on to the relevant volume, issue and page number. Helpfully, the full reference is given on the right-hand helper frame (see images above and below). 2. Or you may use the "Also available online from: try a different source" drop-down menu, if one exists. In this case there is an alternative source: Business Source Premier on EBSCOhost. If you are using Inernet Explorer you may find that the PDF content does not display. If so, see the related LibAnswer link below.